We’re busily preparing for this year’s DKC Frolic! And of course bottles and bottles and bottles of Soak! Come see us. Come shop. Come say hello. We look forward to seeing you there! Marketplace: Saturday 9:00 a.m. to 4:30 p.m.
Workshops: Saturday 9:30 a.m. to 5:30 p.m., Sunday 10:00 a.m. to 5:00 p.m.
We are hiring. You may have seen our teaser post on Facebook, or heard it through the grapevine. We are growing and we need you! Job Title: Central Intelligence, a.k.a. office support, customer expert, assistant to everyone. 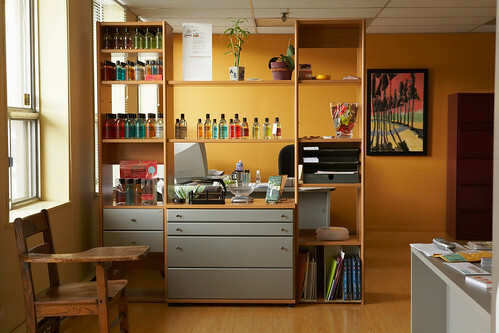 At Soak Wash Inc., we develop and market leading products for laundry and skin care. Soak, our primary product, is modern care for the laundry you love. Our office environment is fun, fast-paced and friendly. The role of Central Intelligence will be filled be someone who is always on top of business. They are the hub of information on customer needs, Soak production and inventory. We’re looking for a candidate that can gracefully manage the administrative and book-keeping functions of our fun-spirited fast-paced office and (no pressure) interact positively with customers, suppliers and current employees. The ideal candidate will have an interest in customer service (a positive, professional and outgoing personality) as well as a desire to grow with the organization. This position is part-time. 3 days per week. M, W, Th. at our lovely Mississauga office. Please visit our website soakwash.com to learn about our company and products before applying for the position. We are all as passionate about our products as we are our jobs. If filled by the perfect candidate, this position has the potential to evolve into full-time employment. Please submit CV with a letter of intent outlining how both your experience and personality are ideal for our fast-paced, fun, growing environment. Please also include your favorite thing about Soak. We appreciate your interest in this position, however, only the candidates selected for an interview will be contacted. Send intent to: hireme@soakwash.com No phone calls, please. Thank you for choosing Soak. Have a lovely day. We have seen a few posts floating around talking about matching knits to nails over the last few months. Naturally we thought it was high time for us to put out our own list of favourite nail trends and matching knits! I fell in love with these simple rainbow fingerless mitts by Elise Dupont quite a while ago. The pattern is available in french from the online magazine In The Loops, or as an english as a ravelry download. They are such a great showcase for little bits of colour. Similarly, the rainbow French Tips that Jennifer of Fab Fatale posted are a great way to push the nail trend without committing to something too complicated. How cute is the Honors Geometry cowl by Katie Canavan?! The colour combinations for this are endless. 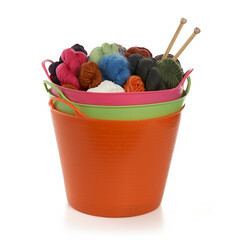 I love how it looks in the bright colours, but wouldn’t it look fabulous in neutrals as well? The triangle look is a perfect match for the triangle nail tutorial I found. It’s not in English, but the photos are very clear on how to get the triangle effect. The tagline for these nails was Aztec, but I think most knitters agree that they look more like a colourwork sweater! These nails are certainly something to aspire to, I can’t imagine the patience required, but they do look like a lot of fun. I had a lot of fun looking at different colour combinations of Ann Weaver’s Oranje cardican on Ravelry. In the end I went with her original sweater from the pattern photos. The pop of orange is so much fun. Of course, nail polish is only the beginning of things you can do on your nails. Nail decals are a fun alternative to having high detail without the worry of making a mistake. They go on like temporary tattoos. It would be so much fun to pair Natalie Selles’ Oh Deer! mittens with these deer decals from JsUtopia. There a lots of decal options out there, so the pairing options are endless. The ombre trend has been all over recently. 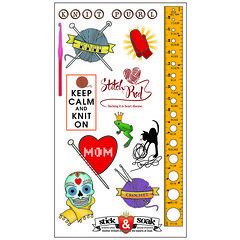 Knitting and nails are only the tip of the iceberg. I love this simple cardigan by Tanis Lavallee. I love how Julie’s Ombre moves from brown to red, and would look great with almost any combination of colours. Of course we have to include something about Soakboxes as well! A solid nail matched with a solid yarn is an easy and fun way to get matchy. It’s also the easiest to change almost as often as you change your mittens. 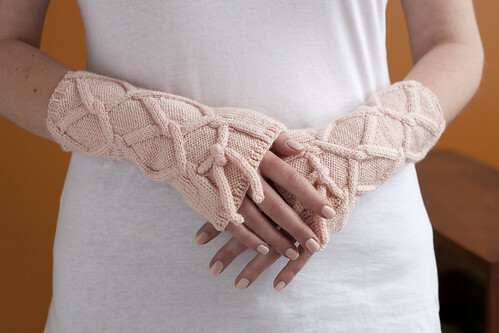 Do you have any favourite nail and knitting combinations? Share them in the comments! P.S. Don’t forget, we’ve still got free shipping going on for continental US and Canada until December 11! Order your Soak products today! Handmaid. A luxury hand creme from the experts at Soak. Occasionally, we work on top-secret projects, to bring you new and useful products. We’ve spent the past few months cooking up such luxuries as our new hand creme. Enjoy. It’s as simple as that. Available in your favorite (and current) Soak scents, aquae, celebration, lacey and of course, scentless. This little gem of a bottle is our new 3oz (yes, flight friendly, for your knitting bag, purse, toiletry case or weekender bag) 100% post-consumer resin bottle. It’s perfect for you, and the environment. Ask for it by name, at your LYS. Invite your favorite lingerie or gift shop to start selling it. If you are a Soak retailer (or would like to become one) and want to start carrying Handmaid, let us know. You can also find Handmaid on our website, if you just can’t wait to give your hands the love they deserve. Handmaid is also part of another project we’ve been working on. Watch in the coming days, for updates and details on our newest project. We’re pretty excited, and we know you will be too! The 12 tasks of holiday. As the holidays approach, Jacqueline shares with us her plan to conquer December. Let December begin. The month of meetings, parties, events and holidays. When every day seems too short and the to-do lists pile up and up. 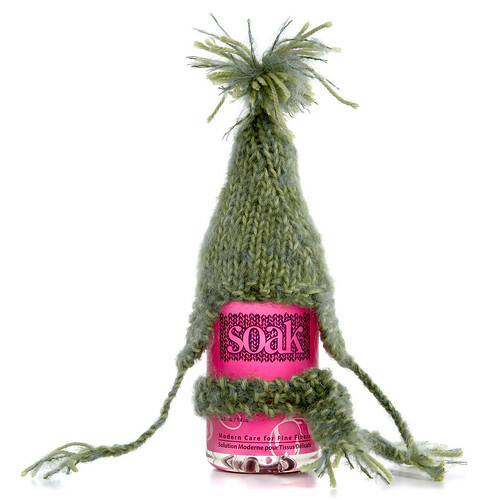 Soak sales are also on the rise, as lingerie loving fashionistas and crafty knitters alike choose Soak for their loved ones and themselves this holiday season. Rather than chronicling the 12 days of Christmas, or a countdown to Hanukah, or worrying about all the other obligations of December, today I’m outlining my 12 tasks for the holiday season. I’m limiting myself to 12 specific deliverables, in an effort to actually get through (some of) them, and to avoid wasting days and hours of pondering what I’ll do for the week between Christmas and 2012. We work hard throughout the year, to we cherish a few extra days off while the office is quiet. This year I’m making the most of them. I’m balancing tasks between the Soak office, much needed love at home and my craft projects. While I wish I could devote the holiday week entirely to craft projects (in my newly sewn pajamas), reality says otherwise. Reality, plus two tradeshows in January. So here’s my list. I’m already on it, so as to finish by the end of the month. I’ll keep you posted as each event progresses. Some may seem more inspiring than others, either way, they must be done! Determine scale and fabric plan for Farmer’s Wife Quilt Along. I’m thinking about enlarging the original pattern to 8” or 9” squares, in order to make a king size quilt with slightly larger pieces. Finish (mostly) 4 ongoing quilt projects so I can start my Farmer’s Wife Quilt guilt-free. Rearrange my office; it has been 4 years now, and I’m ready for some change. Plus, it’d be nice to have a work surface for new product development that doesn’t have to be cleaned up by lunch. Reorganize files on the server. Growing from working alone to having a team of four means messy file folders. Organize recipe binder. I love to cook; I don’t love to put stuff away after. Update mail server and all related details (clean out emails, organize mailing list subscriptions). I receive a lot of newsletters and industry information. It needs some organization. Pre-launch testing on new website, complete with wholesale ordering online! Yup, it’s really happening. We’re moving into a new age of online shopping. Make a carrying case for my sewing machine table. It’s one of those large objects that are always in the way, when not in use. Update warehouse layout for new products (an excuse to play with the forklift). Edit more how-to videos for YouTube and our media friends. Frame this year’s ‘thank-you cards’ for the office. And frame last year’s, which are still in the bag with the frame. Plan a crafty menu for my annual New Year’s Day brunch. Here is a sneak peak of my Liberty stash. I’m going to work very hard to accomplish and share all of the above tasks, instead of locking myself up with my Liberty fabric, like I’d like to do.